Two new species of zooplanktivorous haplochromine cichlids from Lake Victoria, Tanzania, have been described in the recent issue of Zookeys, by researchers from the Naturalis Biodiversity Center and the Institute of Biology Leiden, the Netherlands. The two species, Haplochromis argens and H. goldschmidti (previously known as Haplochromis or Yssichromis "argens" and Haplochromis "dusky argens" respectively) closely resemble each other, but the paper demonstrate that the morphology of sympatric populations of the two species differ more than between populations from different locations, suggesting the existence of two species. H. argens is regarded as extremely rare and probably in danger of extinction, while the conservation status of H. goldschmidti, named in honour of Tijs Goldschmidt author of the book Darwin's Dreampond, is currently unknown. Lamprologus lethops finally pictured alive! The new issue of Cichlid News (v. 22, n. 1 – January 2013) brings a pleasant surprise for cichlid lovers, particularly those who specialize on African riverine species. One article by Oliver Lucanus presents the first pictures ever published of a live Lamprologus lethops, the only blind and most enigmatic of the cichlids, which inhabits in the deeper areas of the Congo River between Kinshasa and Brazzaville [Democratic Republic of Congo]. In this area the river is forced into a narrow channel and can reach up to 200 meters depth. The great volume of water pushes through at a great speed and turbulence, so much that you can’t see your hand already at 20 cm of depth. All previous efforts to bring this fish alive had failed, as most fish would die from the bends and shock produced by bringing them up after capture. At great cost and effort Oliver Lucanus has finally succeeded in the most unlikely, to take to Canada live specimen and make them thrive. Already his observations on the husbandry of this species are fascinating. A new genus for the species hitherto known as Tilapia bilineata Pellegrin, 1900, has been described: Congolapia Dunz, Vreven & Schliewen, 2012. The new genus is defined by morphological and color characters, but it is also supported by DNA analyses. Apart from the type species, Congolapia bilineata, two further species were included: Congolapia crassa (Pellegrin, 1903) has been removed from the synonymy of C. bilineata, and a new species, Congolapia louna, has been described. The latter is only known from a tributary of the Lefini River (Republic of the Congo), whereas the two other species are widespread in the central Congo basin. This interesting work is part of a comprehensive revisional study of the genus Tilapia, which will most likely result in the adddition of further genera. A new species of Andinoacara from the Rio Esmeraldas drainage in Ecuador has been described: Andinoacara blombergi Wijkmark, Kullander & Barriga Salazar, 2012. The new species is very similar to Andinoacara rivulatus (Günther, 1860), which was redescribed in the present paper based on specimens from the Guayas, Tumbes and Zarumilla drainages in Ecuador and Peru. A common lectotype for this species and Acara aequinoctialis Regan, 1905 has been designated. The status of the latter as an objective junior synonym is thus confirmed. The new species was previously believed to be conspecific with, or sometimes, indeed, to represent the 'true' A. rivulatus. However, the present study demonstrates that this name correctly applies to the species well known in the aquarium hobby as 'Goldsaum' cichlid..
A new Eretmodus species has been described and the author, Warren Burgess, named it after Mark Smith, one of the fellows and curators of this site (congratulations Mark!). The description was published simultaneously in English and in Polish in the magazine “Tanganika Magazyn”. I can’t read Polish but I hope they mentioned that only the English version is to be regarded as the proper description, else we have a problem referring to it. Although it is mentioned that the types of the new species were collected at Makombe in Burundi, there is no date or name of the collector(s) given. The photo of a live specimen that accompanies the description shows a specimen of what Patrick Tawil calls Eretmodus sp. ‘ubwari’ although Burgess claims that his new species represents what I have been referring to as Eretmodus sp. ‘north’. Both these species are recognized as valid on this site. I suspect that the types were not collected by the author or by Mark Smith, but obtained via the aquarium hobby. Patrick Tawil (pers. comm.) tells me that he has seen both species in shipments from Burundi and therefore concludes that both species are found sympatrically. I’m a little less certain about this assumption since I have dived at Makombe and only noticed one species of Eretmodus, i.e. E. sp. ‘north’. Both Patrick and I agree that the type series of E. marksmithi very likely consists of two species and it will be up to others to find out what actually represents this species..
López-Hernández & al. (2012) have described two new species of the previously monotypic South American cichlid genus Mazarunia, Mazarunia charadrica and Mazarunia pala. Regarding morphology and color pattern, both are strikingly distinct from the type species, M. mazarunii, which strongly contrasts with the situation in the closely related genus Guinacara and most other genera. Nevertheless, the monophyly of the genus seems well supported by the used datasets. All three species of Mazarunia are restricted to the Upper Mazaruni drainage in Guyana and do further elaborate the status of that area as a center of endemism. One of the new species, Mazarunia charadrica, is already known in the hobby. In the 1990s, it has been confused with M. mazarunii. After the proper identification of the latter, it was referred to as 'Red Patwa'. Stawikowski (DATZ 11 and 12/2003; see also Stawikowski & Werner 2004: "Die Buntbarsche Amerikas. Band 3") gives a full account of the breeding behavior (in aquarium) of both M. mazarunii and M. charadrica..
Kullander et al. (2012) describe a new species of Lepidiolamprologus from Lake Tanganyika. The new species, L. kamambae, closely resembles L. kendalli and L. elongatus, but can be told apart from these by “a broad dark stripe on cheek”. Their color description of the preserved types mentions “…a light to dark brown blotch or wide stripe variably extending posteroventrad from orbit minimally to halfway point, maximally to contact with inner margin of preopercle”. This stripe, however, is not very distinct on the specimen photographed underwater, but that specimen looks like a “washed-out” L. kendalli and it could be a northern population of that species although it was never seen between Kala and Kamamba Island, the type locality and one of the two places the new species was seen (the other at the northern end of nearby Kerenge Island). They compared the new species with L. kendalli from Muzi but the dark blotch on the cheek of that population looks different in that of the Kala population where it is broken up in irregular lines (see accompanying photo). Extrapolating, one could imagine an incremental loss of coloration on the cheek (and other parts) with the “diagnostic” bar below the eye left in the northernmost population. Instead of comparing the new species with similar species from the same locality, and therefore proving its valid status, Kullander and coworkers compared L. kamambae with L. elongatus from near Kabwe (about 40 km north in a straight line) and with L. mimicus from “Frontosa Reef” (about 30 km north). Both these species should be sympatric with L. kamambae and a comparison with those, or even just the fact that their existence in sympatry with the species is proved, should have been presented. It is not difficult to find morphological differences between different populations of the same species, but that doesn’t validate an assumption of a new species; sympatry with like species does. Oliver further claims that the species is extremely rare because only two specimens were ever collected, one by himself and another by Snoeks & Hanssens (2004), which became the paratype. When I saw the photo of Snoeks & Hannsens’ fish in 2004, which they named Hemitaeniochromis sp. ‘insignis big eye’, I recognized immediately that this was very likely the fish I had provisionally named H. sp. ‘spilopterus blue’, but I forgot to mention this observation in my latest book (Konings 2007). Over the years I have seen ‘Spilopterus Blue’ at many places around the lake and it is not a rare species. The rarity of Oliver’s H. brachyrhynchus is possibly due to the fact that he dealt with fish that were collected by nets. H. sp. ‘spilopterus blue’ is a cave dweller and is usually found at levels below 25 meters. These are not qualities that would make it likely that ‘spilopterus blue’ ends up in a net. I would be very hesitant to describe a new Malawi cichlid if I wouldn’t know its life history or at least know what it looks like alive. Oliver dismissed ‘spilopterus blue’ even to be a member of Hemitaeniochromis because, he reasoned, the photo of a female in my book showed it with a continuous midlateral stripe and would be more likely a member of Protomelas. Most individuals of ‘spilopterus blue’, however, have a pattern in which the midlateral stripe is broken up into spots, but it seems that brood caring females have a complete midlateral stripe (have photos of only three different females). Of course, the melanin pattern can be enhanced or completely lacking when a fish is dead, and when you have only dead specimens to contend with you wouldn’t know. Oliver further argues that the preorbital depth is about 55% of eye length in my photo of a fully grown male, but this must be a typo as I measure about 46% in the same photo. For the time being we keep both species, H. sp. ‘spilopterus blue’ and H. brachyrhynchus, in the catalog until I have examined the 17 specimens I have collected over the years and which are now lodged in the Penn State museum. I’ll keep you posted. Ota and coworkers (2012) recently published a paper in which they claim that Neolamprologus brevis (= ‘Lamprologus’ brevis) has alternative reproductive tactics (ARTs). Usually we have come to expect excellent field work from this group of Japanese researchers but with this paper they have made an important mistake in my opinion. There is no question about the fact that ‘Lamprologus’ brevis and ‘Lamprologus’ calliurus are two different species and which are sometimes found within a short distance of each other. Males are very simply distinguished by the round tail in ‘L.’ brevis and the truncated (lyre) tail in ‘L.’ calliurus. Not only morphologically do they differ (‘L.’ calliurus gets considerably larger than ‘L.’ brevis) but more importantly do they differ in breeding technique. In Ota et al.’s paper we find this sentence: “A Lamprologini cichlid, Neolamprologus brevis (a synonym of Neolamprologus calliurus ) (sic)…”. First off, they should have written “(N. calliurus is a synonym)” because L. brevis was described seven years earlier and has priority. Then the journal has this awful usage of reference numbers instead of authors and year. Anyway, the ref  points to an unpublished thesis by Aibara (2005) to justify the synonymization of these two species, which is of course preceded by Poll who suggested this in 1986, almost 20 years earlier. I have not seen this thesis and it is entirely possible that the fish we all know as ‘L.’ brevis is in fact an undescribed species and the name ‘L.’ brevis should be given to the lyre-tail species (but the authors should have mentioned such an important detail), but the fact remains that there are two different species involved. From the rest of the paper I deduct that the single-shell breeding cichlid, our ‘L.’ brevis, are just subadult individuals (although I have video of females with young in that single shell) and that the larger individuals, our ‘L.’ calliurus, are the adults and they form harems over shell patches made by ‘L.’ callipterus males. None of this is news as this has been reported of these two species before (Konings, 1998), but if you group two species under one name you automatically get alternative reproductive tactics. The only interesting part is now, “Where do I get that Aibara thesis?. The description of a new species of Congochromis, C. robustus from the Congo Democratic Republic by Anton Lamboj has been published in Cybium. The new species is just known from the type locality near Yaekama, in the Congo River system, types are located at the Royal Museum from Central Africa [Teruven, Belgium]. Within just a few years, the genus Australoheros has become one of the most speciose Neotropical cichlid genera. Felipe Ottoni has added three further species: Australoheros mattosi from the upper Rio Sao Fransisco drainage, Australoheros montanus from the Rio Paquequer drainage (Rio Paraíba do Sul basin) and Australoheros tavaresi from the upper Rio Tieté (Alto Paraná drainage). Furthermore, Ottoni regards Chromys oblonga Castelnau, 1855 as unidentifiable and designated a lectotype for Heros autochthon Günther, 1862, allegedly not belonging to the genus Australoheros..
Konings and Stauffer describe Melanochromis mpoto, formerly known as Melanochromis 'blue', from the northwestern part of Lake Malawi. They further review a number of species poorly described by Johnson in the 1970s and 80s from aquarium specimens and found that they needed to synonymize M. parallelus Burgess & Axelrod 1976 with M. loriae Johnson 1975, and redescribe M. chipokae Johnson 1975. These two species were confused in the literature because of Johnson's mixing up of the photos accompanying his description. Konings and Stauffer further define the enigmatic M. robustus Johnson 1985, which was described from an overfed aquarium specimen of unknown provenance. Comparison of the latter species with a species previously known as Melanochromis brevis revealed that these are two different entities and that M. brevis actually is conspecific with the informal species Pseudotropheus 'williamsi nkhudzi' from Ribbink et al. (1983). Konings and Stauffer therefore reclassify Trewavas's M. brevis and place it in the genus Pseudotropheus and further designate a lectotype and a paralectotype for P. brevis. The large Melanochromis known from Chinyankwazi and Mumbo Islands is now identified as M. robustus. In an article in the recent issue of the German Amazonas magazine published by Natur und Tier-Verlag, Münster, Oliver Lucanus presents spectacular photos of live individuals of several southern species of the genus Crenicichla, which have never been photographed before, including C. yaha, C. hu, and C. iguassuensis, as well as the undescribed C. sp. "uruguay black line" and the stunning C. sp. "botox/iguassu big lips 2". A new paper by Sven Kullander published in the recent issue of Zootaxa formally describe Krobia xinguensis from localities in the headwaters and in the lower part of the rio Xingu. It is distinguished primarily by a deeper caudal peduncle, and details of its color pattern, including contrasting interorbital stripes and a small dark spot anteriorly on each side of the lower jaw, and a rich orange coloration in live specimens. Krobia xinguensis has previously been known as Krobia sp. "xingu" in the aquarium hobby. In the paper Kullander also state that K. potaroensis and K. paloemeuensis, currently assigned to Krobia, is better included in the catch-all genus Aequidens, until further morphological analyses may provide support for an alternative generic classification of these two species. A recently published study by Sven O. Kullander and Tyson R. Roberts (2011) shows that some Lake Tanganyika endemic fishes, including at least seven cichlids (one potentially undescribed) inhabit also the rapids of the Lukuga River (a river draining the lake) as far as 100 km away from it. This shows that the belief that Lake Tanganyikan cichlids can just survive in the particular lacustrine conditions where they evolved may be have to be reconsidered. Cichlid species found were Astatotilapia burtoni, Ctenochromis horei, Simochromis babaulti, Simochromis diagramma, Telmatochromis dhonti, Tylochromis polylepis, and a potentially undescribed Tanganicodus species, in an stable fish community independent of the lake. A new paper by Topi K. Lehtonen, Jeffrey K. McCrary and Axel Meyer has been published in the online magazine Plos One on January 9, 2012. The paper deals with the response of parental Amphilophus zaliosus in Lake Apoyo Nicaragua, to the approaches of the introduced predator Gobiomorus dormitor, the sleeper goby. The study shows that A. zaliosus, not familiar with the predator, allows it to come closer to its fry before starting a defense behavior, which may cause a higher predation rate on the fry. Gobiomorus dormitor, present natively in other lakes where related Amphilophus species inhabit, is attacked at a farther distance in every occasion. The study shows one of the dangers that introduced species pose to native fauna. An interesting paper on the genus Crenicichla has been published in the latest issue of Molecular Phylogenetics and Evolution. A molecular analysis combining both mitochondrial and nuclear genes demonstrates that Crenicichla consist of two major clades, the first including the C. wallacii, C. lugubris, and C. saxatilis species-groups, as well as Teleocichla, and the second of the C. reticulata and C. lacustris species-groups, and C. macrophthalma. The study furthermore confirm the monophyly of the C. lacustris species-group with a very high support. A biogeographic reconstruction of this species-group using dispersal-vicariance analysis underlines the importance of ancient geographic barriers between the middle and upper Paraná River (the Guaíra Falls) and between the middle and upper Uruguay River (the Moconá Falls). The phylogeny presented in the paper also recovers two endemic species flocks within the C. lacustris group, the well known Crenicichla missioneira species flock from the Uruguay River, and the newly discovered Crenicichla mandelburgeri species flock from the Paraná/Iguazú Rivers. Among the many other interesting aspects of the paper is the finding, that within the nominal species C. lacustris three deeply isolated allopatric lineages are recovered. Two of these lineages agree with the nominal taxa C. biocellata and C. dorsocellata today considered synonyms of C. lacustris The generic distances between them indicate several million years of isolation and support the existence of several species. A new paper published in Journal of Evolutionary Biology demonstrates that the course of speciation in the genus Steatocranus repeatedly has been affected by hybridization events. The genus radiated under riverine conditions in the lower Congo rapids and produced a small species flock. An analysis explicitly testing for patterns of ancient gene flow provides evidence for a highly reticulate phylogenetic history of the genus. Martin Genner and George Turner compared the nuclear DNA with that of mitochondria in a series of Malawi cichlids and found that on the basis of nuclear DNA the deep-dwelling species (Placidochromis, Lethrinops, Alticorpus) were closely related to morphologically similar forms of the shallow water (all other non-mbuna), but if they compared the mitochondrial DNA they were surprised to find all the deep water species nested within the mbuna. Years ago, Moran & Kornfield (1993) had similar results using mitochondrial DNA probes when they claimed that e.g. Alticorpus was closer related to mbuna than to shallow water Lethrinops. This then resulted in disbelieve and the abandonment of mtDNA phylogenies (since they were not congruent with old-fashioned morphology) in favor of nuclear DNA phylogenies. Now, when Genner & Turner compared the two methods they come to a very interesting conclusion in that (pre)mbuna and the precursor(s) of the deep-water cichlids hybridized a long time ago before the deep-water species developed into what they are today. They also give an interesting discussion in which they argue that the hybridization may have given the hybrids a set of altered genes that actually allowed them to explore and adapt to different habitats (the deep, dark waters of the lake). Clearly the deep-water species of Lake Malawi need more study. 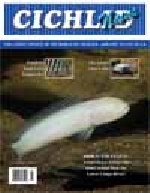 The first published picture of Pterochromis congicus ever has appeared as the cover of Cichlid News January 2012 issue. The picture was taken by Oliver Lucanus in his aquarium and corresponds to an specimen from Lac Mai Ndombe [Democratic Republic of Congo] in the Congo River drainage. According to Oliver, the fish seems to be extremely rare in nature, often being outnumbered by Tylochromis, Hemichromis, Sarothoredon and Tilapia by 100 to 1. We were also supplied by Oliver with not one but two pictures of this amazing fish, which are now part of our cichlid catalog, as the first pictures of this fish online.